Maxi dress is a closet staple and every woman should have a few in her closet. One of my favorite places for unique maxi for over 10 years now has been Ladyee Boutique. I still own maxis I purchased that long ago and unlike trendy styles, Maxis are always In! Keep reading to see more images of this gorgeous pink number that looks great on everyone. Click HERE for other times I have worn this brand. Head to your favorite seamstress or if you have some tailoring skills, hem to ensure it fits your frame. Whether you love your maxis to touch the floor( like me) or you prefer it just hitting your ankle don’t be afraid to get it altered. My maxi has a belt which makes it perfect regardless of your waist size and it is definitely accommodating of different bosom sizes. Anything from a simple pair of hoops to a silk scarf is perfect with a maxi dress. Don’t overdo it with accessories especially when wearing busy prints. I wore more than usual accessories here because my maxi dress is a plain color. All my accessories are linked below. I am a firm believer that dressing starts from our underwear and I have seen a lot of faux pas when it comes to women and maxi dresses. 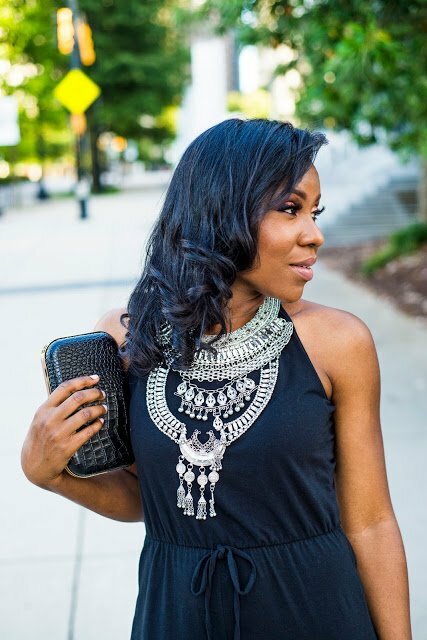 Opt for a lower plunging bra when you are wearing a low cut or v neck maxi like I did. HERE is my favorite low plunge bra. Also wearing shapewear makes a world of difference. I am wearing one under this maxi because I realized it was a tad see through. A maxi can be worn to a casual outing, date night and even as a wedding guest outfit depending on how well it is accessorized. Switching my slides to heels, putting my hair in an updo, switching my bag for a clutch and wearing statement earrings transforms my look from a casual day look to an event ready outfit. Thanks for reading, remember to check out LADYEE BOUTIQUE for fabulous pieces that last!